172 year old Saiwan boundary marker stone found! 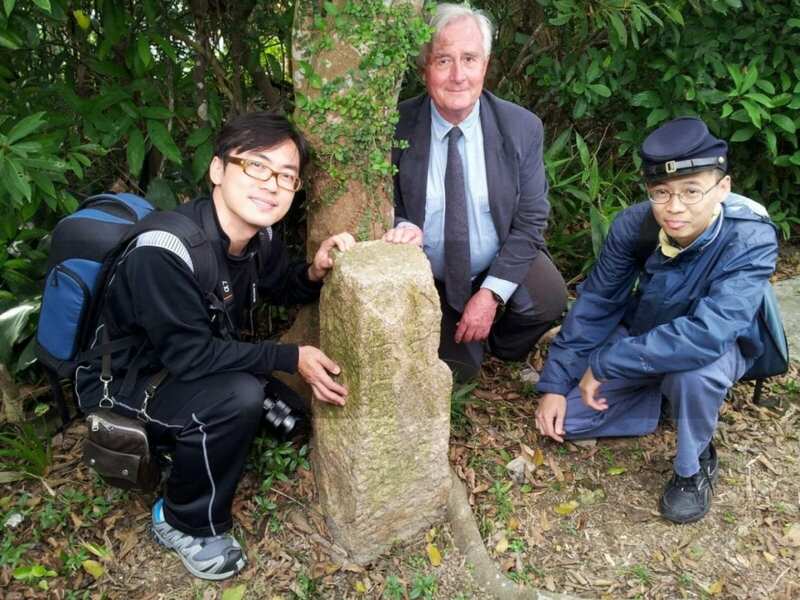 Teachers and students of Department of Real Estate and Construction of the University of Hong Kong (HKU) discovered a long forgotten boundary marker stone from the very earliest days of the British presence in Hong Kong. This B.O. No4, boundary stone, is located in the Lei Yue Mun Park and Holiday Village in Sai Wan Shan. Research by Dr Stephen N.G. Davies, Lecturer of the Department, has identified the stone’s provenance. “B.O.” stands for ‘Board of Ordnance’, the British military authority in charge of surveying and mapping before 1855. That clue led to its identification on Hong Kong’s oldest scientifically surveyed map, the Ordnance Map of Hong Kong of 1845 by Lt. Thomas Bernard Collinson Royal Engineers. In late September, in preparing for a course field trip of HKU’s common core course CCCH9031 “Property Rights, Built Heritage and Sustainable Development in Hong Kong”, Dr Davies identified the location of a “War Department boundary stone, B.O. No.4” on an 1895 building plan of Saiwan Redoubt in the British National Archives. Students on the Department’s common core course, in groups led by Mr Chan Yiu-hung found the stone itself during the course field trip on 3rd October. The 172 year old stone was standing exactly where the 1895 map had showed it, despite the heavy bombardment the historic Redoubt had suffered in the Japanese invasion in 1941 and extensive post-war alterations. On a subsequent visit, a team of professional land surveyors, led by Dr Ken Ching Siu-tong, an alumnus of the Department and a professional land surveyor, closely surveyed the stone to confirm Dr Davies’ identification. Precise geo-referencing process with respect to contemporary coordinate grid was performed in an ArcGIS platform showed the stone to be exactly where Lt Collinson had put it and mapped it. In addition, Sr Natalie Chan Wing-shan also identified an original survey benchmark, placed during the building of the Redoubt in 1895. The stone has suffered some damage over the years but all the original markings are still legible. However, unchecked growth of vegetation in the neglected Redoubt means a tree is now growing right beside the stone, threatening to push it over and further damage it. The Department has informed the Antiquities and Monuments Office of its finding. Professor Chau Kwong-wing, Head of Department and Chair Professor, has sent the Commissioner for Heritage a recommendation, drafted by Dr Stephen N.G. Davies in consultation with Professors Lawrence Lai Wai-chung and Dr Daniel Ho Chi-wing, that the stone be made an AAB Grade I listed object.